Click here to play Jackie's "Year of the Sheep" game at miliku.com. Shanghai Knights has opened to excellent reviews in Singapore. According to Fluff Jackie will be traveling across the globe to promote this film. He is heading for Germany, England, Los Angeles, New York, Berlin, and other spots. After the promotional tour ends, Jackie will begin filming Around the World in Eighty Days. At a press conference in Taiwan, Jackie said that he was very happy with this film and that because of the freedom he was given he was allowed to give his best performance. Jackie talked about his desire to make all kinds of movies, including drama. He mentioned that the script for the final Police Story film is finished and it is just a matter of coordinating schedules to get it made. 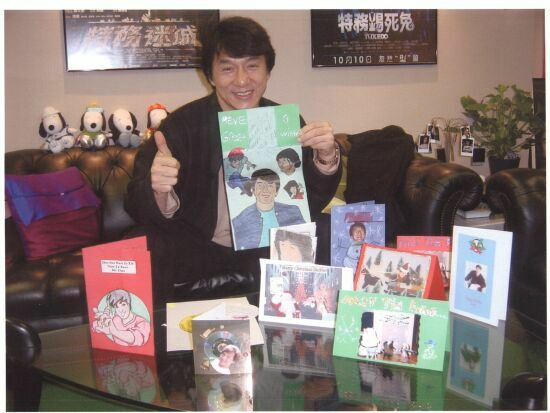 It was also reported that Jackie has donated 4,000 down jackiets to the Salvation Army for China disaster relief. 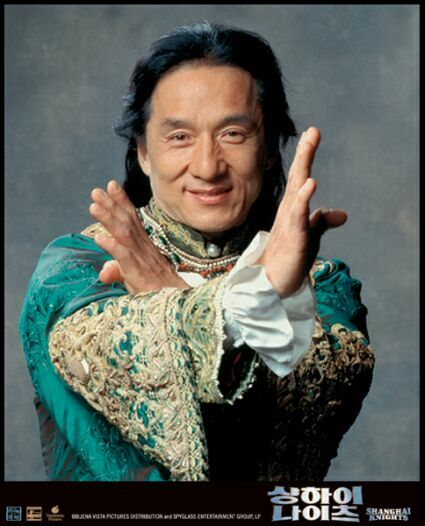 As Jackie makes the rounds promoting Shanghai Knights, he will be appearing on several television shows. Click here to see a tentative schedule provided to the Kids Club by Marie M. Thanks Marie. Plot: Combining the physicality of international action superstar Jackie Chan with state-of-the-art special effects, Highbinders is an action comedy co-starring Claire Forlani and Julian Sands. Chan stars as Eddie, an indomitable Hong Kong cop who, after a near-fatal accident involving a mysterious medallion, is suddenly transformed into a Highbinder -- an immortal warrior with superhuman powers. Eddie enlists the help of fellow agent Nicole (Claire Forlani) to determine the secret of the medallion and face down the evil Highbinders who so desperately want it back. 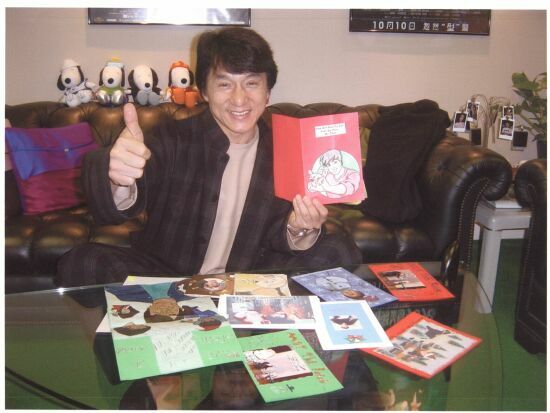 There is some additional information about the Jackie Chan Birthday Card campaign on the Birthday Page. Thanks to Marie M. for pointing out that the contest is for EVERYONE not just for kids! Also, there are some guidelines for gift giving posted there as well. Beware: There's LOTS of news today, so keep going down the page...don't stop or you'll miss something!!! Jackie Chan's "celebrity t-shirt" on ebay has brought in the highest winning bid of all other celebrity shirts. Jackie's shirt sold for a whopping $405 US! It was followed by t-shirts signed by the cast of "Friends" ($305 US). Congratulations to the winning bidder. And of course congratulations to Jackie for raking in more money for charity. 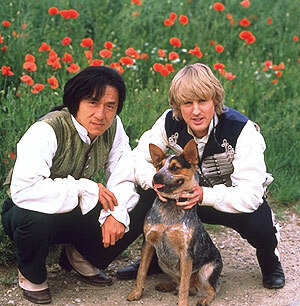 All reports from last weekend's nationwide Sneak Preview of Shanghai Knights point toward a smashing success. The movie was shown at select cities all over the United States and audiences reacted quite well to Jackie's latest American film. This is very good news, especially after the lukewarm reception of The Tuxedo. It has been the policy of the Kids Club news reporter not to post anything that might spoil Shanghai Knights for anyone. However, if you just can't resist having a peek, you can see trailers and movie clips at Yahoo. Click here to go to Yahoo Movies. These clips and trailers contain SPOILERS....don't say you weren't warned!!! Click here to hear Jackie wishing his Korean fans "Happy New Year" in both Korean and English. Here are a few photos of Jackie and Owen from Shanghai Knight's Korean web site. 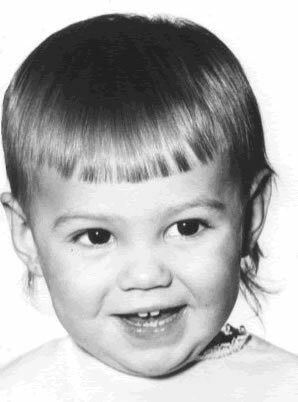 Jackie's birthday is rapidly approaching and the Kids Club would like to send Jackie many wonderful birthday greetings. NOW is the time to act! Click here for all the important information. 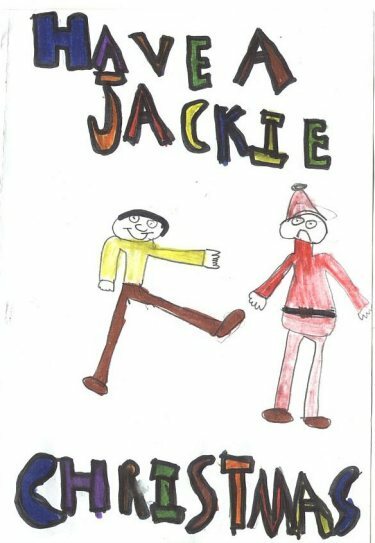 A new page has been added to the Kids Club site where you can go and see some of the wonderful cards that Jackie has sent to the Kids Club. 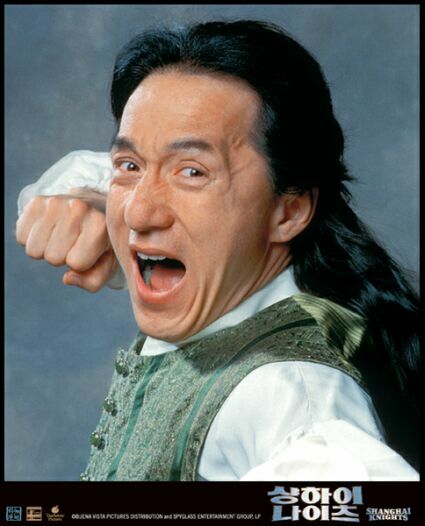 Click here for the Jackie Chan Photo Page. Guess what showed up in the Kids Club post office box a little over a week ago? Give up? 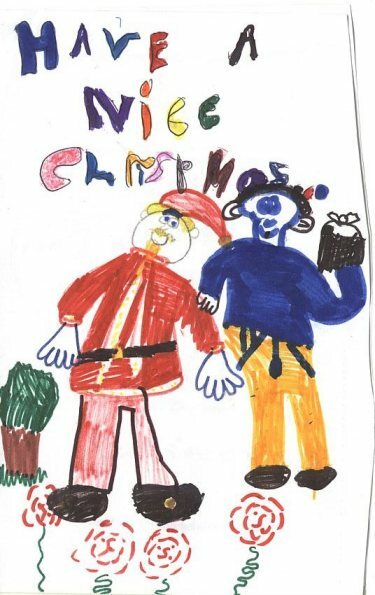 Well it was two beautiful Christmas Cards made by two very special little girls from England. The cards took over 6 weeks to get from England to the USA. Shame on the post office! Of course the cards were not included in the packet that was sent to Jackie, but they will be added to the other cards and put into the "Totally Fun Jackie Stuff" (Page Five) section of the web site. Someday when Jackie is surfing the Kids Club site, perhaps he'll see these two very sweet cards. Click on the cards to see a larger view. Jackie holding Kids Club member Kendra's card. Jackie gives the thumbs up to Kids Club member Steph's card. A big thank you to Jackie and his staff for taking the time to send these wonderful photos. If you sent your card through email and it was posted here on the web site with the others, don't worry.....Jackie visits the Kids Club web site...promise! The Hanes "Tagless T-Shirt" ad with Jackie Chan and Michael Jordan ran during the Super Bowl yesterday. 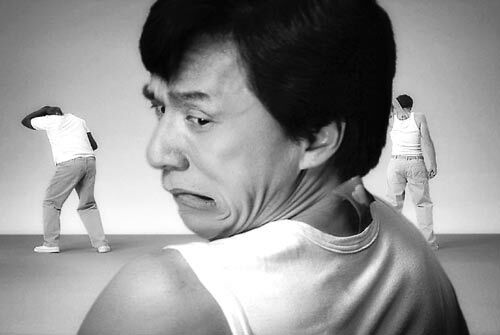 The ad shows Jackie going through all kinds of troubles trying to deal with the itchy tag of his t-shirt. It's pretty funny. If anyone missed seeing it, you can view it here (along with the outtakes from the filming of the commercial). Yes, you guessed it. More Shanghai Knights banners have been spotted in Jackie Chan Fanland. Thanks to the quick camera work of Jackie Chan Fanland Kids Club photographers we are able to see the latest sightings. Click here for the first of two new ones. Click here for the index to all the sightings. The Chinese New Year is fast approaching. Click here to learn some things about this important Chinese holiday. Click here to go to the Jackie Chan Adventures web site and see some cool Chinese New Year stuff. Thank you to Marie M. for finding the Jackie Chan Adventures link! Jackie is making the rounds in Asia to promote Shanghai Knights. 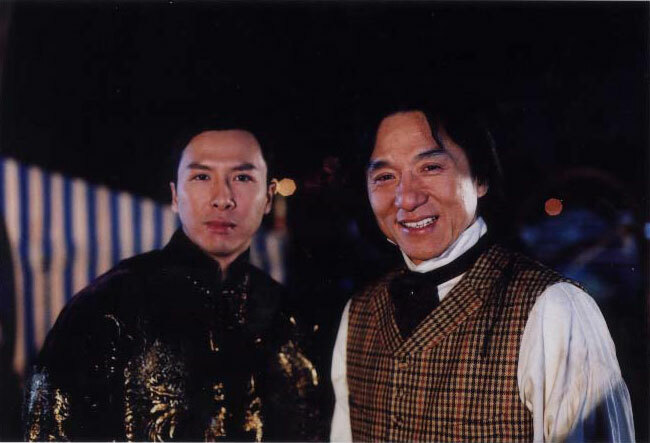 To read what Jackie has to say about his Shanghai Knights co-star Fann Wong, click here. Here are two photos of Jackie at a recent press conference. 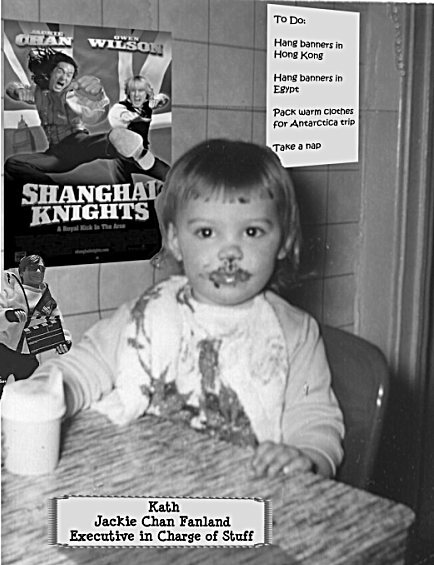 You won't be surprised to learn that another Shanghai Knights banner has been sighted in Jackie Chan Fanland. Click here for the newest* or click here for the index page where you can see all the sightings! *Thanks to Carol S. for suggesting the latest location for a banner! Oh my goodness....more Shanghai Knights banners spotted in Jackie Chan Fanland. Click here for the menu. 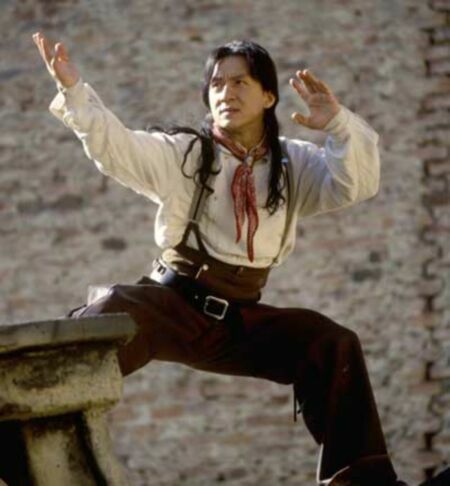 Click here to email a suggestion for a country where the Jackie Chan Fanland Official Shanghai Knights Promoter should place a Shanghai Knights banner! Recently there have been many many news stories which "announce" the fact that Jackie Chan has started using stunt doubles in his movies. Click here to read more about this. Holy cow! The bid for Jackie's signed t-shirt on ebay is up to $255 and there are still 6 days to go on the bidding!! Jackie's shirt has the highest bid of the 40 odd shirts that are being auctioned off. All the profits from this auction will be donated to charity. This auction proves that Jackie Chan is THE most popular star in the world - and he has the most generous and devoted fans. 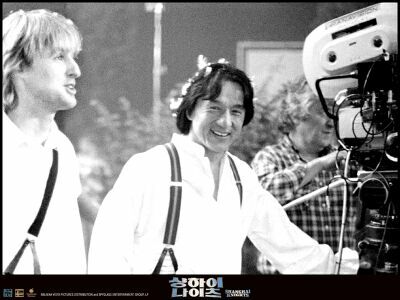 Here are some great behind-the-scenes photos from Shanghai Knights (no spoilers here). They come from the Official Korean Shanghai Knights web site. Thanks to Seung ho over at the JCMB for the heads up. 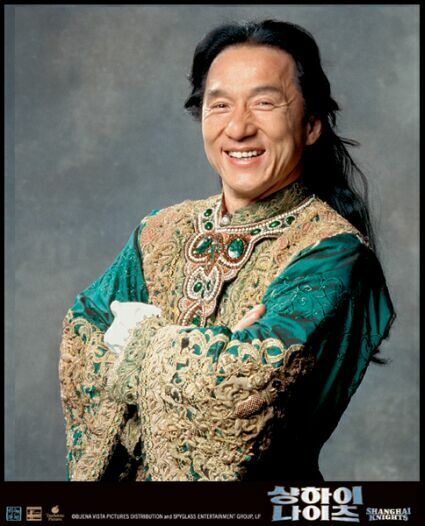 There are a couple of new Shanghai Knights sightings in Jackie Chan Fanland. Click here to go to the index. 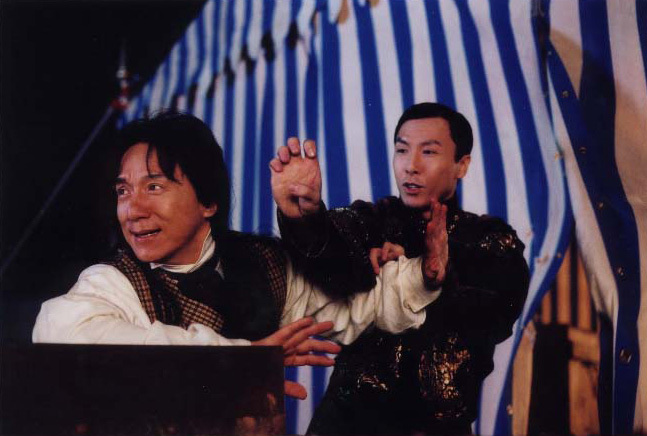 There are links there to the Shanghai Knights Official Site where there are a lot of great photos from the movie. Be warned, however.....there are SPOILERS there. During lunchtime, Garcia, Owens dog, came to visit me in my trailer. He is almost like my dog too because he greets me every day. One of the crew mentioned that once when he was taking him for a walk, Garcia wanted to run towards where I was shooting. Even though I was about a hundred feet away, he recognized my voice. Garcia played in the mud today, but I didnt know. When he came into my trailer, he splattered mud everywhere. I had to order him out so I could get it cleaned up. It took me awhile, but eventually I got every bit of dirt off the rug, the furniture and the walls. I better take a better look at him the next time I invite him in. Jackie has added his signed (and handprinted) t-shirt to those that are being auctioned off for charity. The shirt is being auctioned off on ebay and the money that is earned from the auction will be donated to the Elizabeth Glaser Pediatric AIDS Foundation. Not surprisingly, Jackie's shirt has the second highest bid - $122.50 as of 1/22/03. Incredibly, news agencies around the world have been reporting that Jackie uses a stunt double sometimes. This will come as no surprise to Jackie's fans who know that Jackie has occasionally used stunt doubles for years. Jackie sums it up best when he says: "I will use stunt doubles if you ask me to ride an F-16 jet fighter, or to jump over a series of hurdles with a crazy horse, or to perform two 720-degree somersaults." Jackie also commented that the movie studios sometimes insist that he use a double. 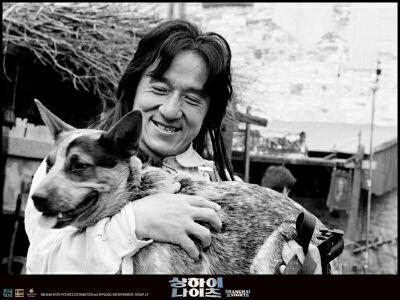 The documentary movie about Jackie Chan and his family, Traces Of A Dragon: Jackie Chan And His Lost Family has been selected by the famous "Panorama Dokumente" series for the Berlin International Film Festival. You can read the press release here. This film by Mabel Cheung and Alex Law contains rare footage, interviews with Jackie and his family, and a look at the history of both Jackie's family and of China itself. 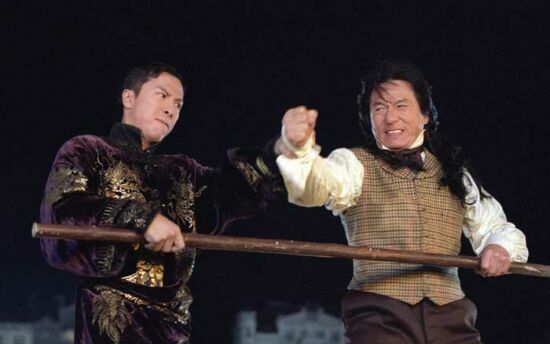 There are a ton of new Shanghai Knights photos at Countingdown.com. But be warned....if you look at some of these photos it may spoil some of the surprises in the movie. Click here to go have a peek. Incredibly, the Kids Club members who have been touring Jackie Chan Fanland have spotted yet more Shanghai Knights advertisements. Click here to see the newest one. Click here to see them all! 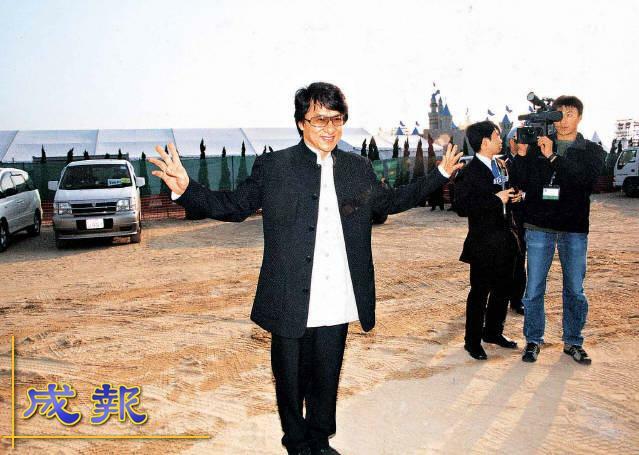 Click the link below to see what's been going on in Jackie Chan Fanland these days. The Shanghai Knights promotion is in full swing! Thanks to some friends of the Kids Club for their contributions to the fun poster projects. Click here to see Kay's page. Well kids, it's happened again! The people who are doing the promotion for Shanghai Knights have chosen some very creative ways to advertise the movie. You must check the Shanghai Knights pages frequently.....there are new additions to the Shanghai Knights Around the World banner photo gallery! Click here to see 'em all! 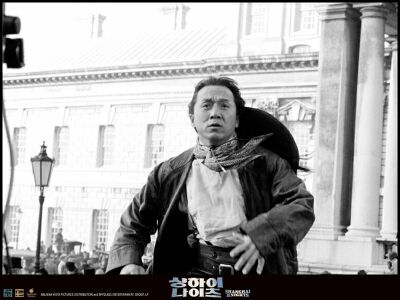 The Shanghai Knights posters have been spotted in a few new countries. Click here to check it out! As promised there are several new additions to the Kids Club web site. Click here to learn about the Chinese New Year. Visit the Kids Club web site's Shanghai Knights Central to see the latest on Jackie's upcoming movie! For those of you who check this web site regularly, you've probably noticed that the news hasn't been updated in a week. Please accept the apologies of the web master....she burned her fingers in an accident and was unable to type for several days. Things are much better now so the web site will be updated on a regular basis again starting today. Fan club members should expect a 5 day delay on the arrival of your newsletters. They were mailed out today. On to the latest Jackie news!!! 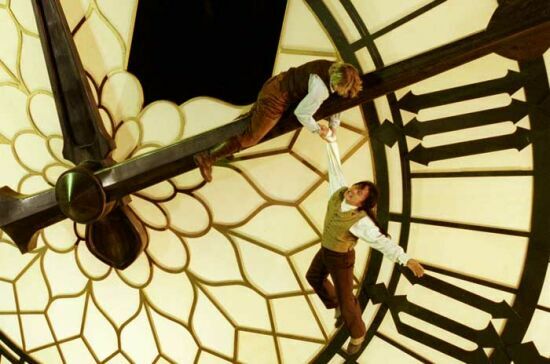 Around the World in Eighty Days looks to be starting production in March. Jackie will play the role of Passepartout. 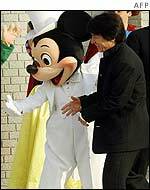 Jackie showed up at the groundbreaking ceremony for Hong Kong Disneyland. The new theme park is scheduled to open in 2005/2006. Here's Jackie at the site of the new Hong Kong Disneyland. 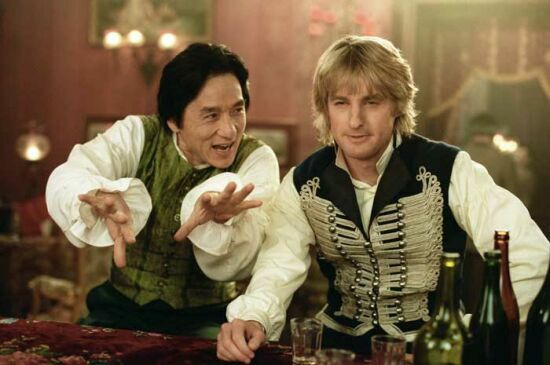 Only one month and a day until the US release of Shanghai Knights. The film is getting some good "buzz" on Internet film preview review sites. The fights are supposed to be spectacular - the best since Drunken Master 2, say some reviewers. 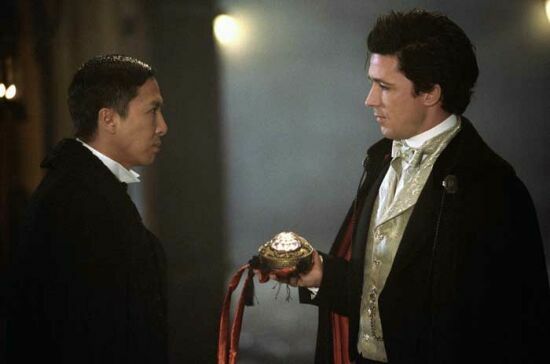 Shanghai Knights will premiere on Feb 3, 2003 at the El Capitan Theater in Hollywood, CA. All photos are ©2003 Touchstone Pictures/Spyglass Entertainment. On December 31, 2002, Jackie made a surprise appearance at Taiwanese pop star A-Mei's New Year's Eve concert. Jackie helped count down the New Year and he even sang a little with A-Mei. Here's a photo of Jackie with A-Mei and others on New Year's Eve. Below: See Jackie hug A-Mei from two different angles! Here's a photo of A-Mei tickling Jackie. Actually, it's anyone's guess what she is really doing! In other news, Jackie has again made it into The Guinness Book of World Records. He holds the record for "Most Stunts by a Living Actor." "Jackie Chan, the Hong Kong actor, director, producer, stunt co-ordinator, and writer has appeared in more than 65 movies, always doing his own stunts. No insurance company will underwrite Chan's productions, in which he performs all his own stunts. 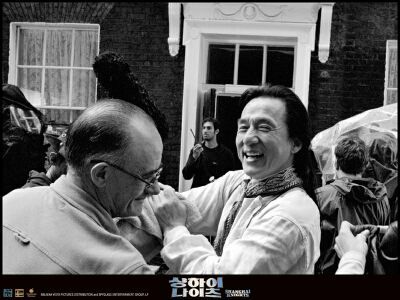 After a number of stuntmen were injured during the making of Police Story (Hong Kong, 1985), the star formed the Jackie Chan Stuntmen Association, training the stuntmen personally and paying their medical bills out of his own pocket." Happy New Year to all of Jackie's fans near and far. The past year has been a very active and exciting year for Jackie...it saw the release of The Tuxedo and Jackie's involvement in the filming of Shanghai Knights, Highbinders, and The Twins Effect. We are all looking forward to 2003 and the February premiere of Shanghai Knights. The Official Jackie Chan Fan Club for Kids is growing steadily and the Kids Club web site has welcomed over 20,000 visitors since it was launched in April! The New Year will certainly see lots more fun stuff here on the Kids Club web site for all of Jackie's fans. 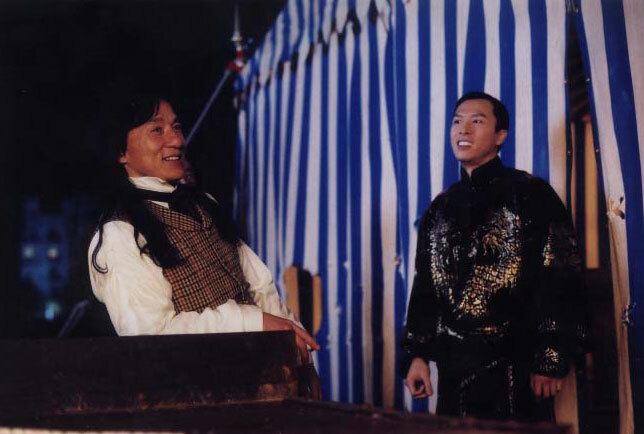 Here are a couple of pictures of Jackie and Shanghai Knights co-star Donnie Yen taken on the SK set.